I love carbohydrates. I love-I love carbohydrates. I love carbohydrates. ts. ts. ts. ts. If you love carbohydrates too, pretend you know the tune to my song and sing along with me. It's currently very techno-y in my head and that's why there are two "I loves". I'm skipping. Now back to our point: what happens when you love carbohydrates as much as I do? You try to add some whole wheat flour to make believe you're healthier. So when you're in the mood to gorge on carbs, pretend you're being good to your body and feel like tricking innocent children into eating health(ier) waffles all at the same time (which can be very confusing, mind you), I recommend you make these. 1. Because they're good and warm and soft. 2. Because they're freezable. Aha. Freezer fun. Become a cryogenicist today. Below is my column featuring this recipe in The Daily News Egypt dated Saturday, June 18th, 2011. Upon exploring one of the city's hypermarkets during my most recent visit to Cairo, I was taken aback by the number of dusty waffle makers sitting sadly on the shelf. Or should we call them multi-purpose snack-making machines? Treading a few steps away from the cashiers, it caught my attention - a shiny, new waffle stand had also made an appearance at the ever-expanding mall, complete with plastic cutlery and no place to sit. The human waffle makers hurriedly poured the gloopy batter into the overlapping hot irons while children, accompanied by freshly-manicured mommies urging them to add fruit, clamored to pick sugar-infested toppings. In the past several years, comfort food in Egypt has been welcomed and has itself welcomed a new addition to the family - the waffle, a soft golden grid that comes in many a shape and tends to disappear under a heavy hand of syrup. Today, waffle irons are usually sold as an afterthought, in a set containing a sandwich maker and a panini grill. I wonder how many of those afterthoughts are taken into consideration and used in the many homes that house the same children rallying to get their sweet treat at the mall. The popularity of waffles has recently surged in the Middle East but are we simply passing them off as a modern Western innovation to be savoured by many? Do they originate in Belgium? Are today's waffles more exciting than those of days gone by? The waffle has come a long way and has evolved from a mere mixture of barley and oats to the numerous forms it takes on today. Waffles have been present in the world's history dating back to Ancient Greece. The people of Athena happily munched on Obelios, flat cakes pressed between two metal plates over hot charcoal, much like the thin wafers of today. Later, the Catholic Church picked up on them and started touting them as one of the more appropriate provisions for fasting season seeing that they didn't contain eggs, dairy products or animal fats. By the Middle Ages, waffles were eaten by just about everyone – rich and poor, peasants and kings. Sold by street vendors and named Waferers in England and Gaufriers in France, the then wafers, soon to become waffles, were catching on like a house on fire. The word “wafre” in Middle English was adopted from the word “wâfel” appearing in Middle Low German, which then later changed to the Modern Dutch “wafel”, French “gaufre” and the German “waffel”. Eventually, the New World created the modern American English waffle by the 18th century. I hope you enjoyed my little etymology lesson. Spreading throughout Europe, people were finding new ways to design their warm waffles using creative waffle irons specially made to brand the homes that requested them. The familiar honeycomb pattern we know today (said to mirror intertwined crosses), coats of arms and religious symbols were all used to mark these tempting tidbits. The wealthier of society would use honey, eggs and wine to flavor the base recipe of flour and water and by 1270, medieval France founded an entire guild that would train the waffle vendors to do a better job on the street. Nearing the early 17th century, the Dutch, who had taken an even stronger liking to waffles than the rest of Europe, took them along with their colonies to what was to become the U.S.A. Rapidly changing in America, the waffle earned the extra “f” and was patented, stovetopped and then paired with electricity. By the 1930s, an electric waffle iron became a much-needed household appliance and by 1953, the world was introduced to store-bought waffles, increasingly available in most parts of the world today. I remember making waffles for my stepchildren for the first time last year, only to find them surprised that we could make them at home and invent toppings to suit the mood. Sneakily, I traded half of the white flour for the superior wheat flour in hopes of teaching them that brown is usually better when it comes to all things bready. Experiencing this together allowed them to genuinely believe that everything can be made at home if you take a little time to do it; and that making a big batch of waffles to freeze for later allows for days on end of pleasurable waffle eating. All you really needed was a waffle iron, a playful attitude and ingredients already in your pantry. We tend to forgo the history of food flogging it as inconsequential. Unfortunately, we have forfeited most of our roots to food because of that. Egyptian chefs and researchers alike can spend hours arguing about the origins of our meals because no one took the time to write our food traditions down after the Ancient Egyptians decided to desert us. 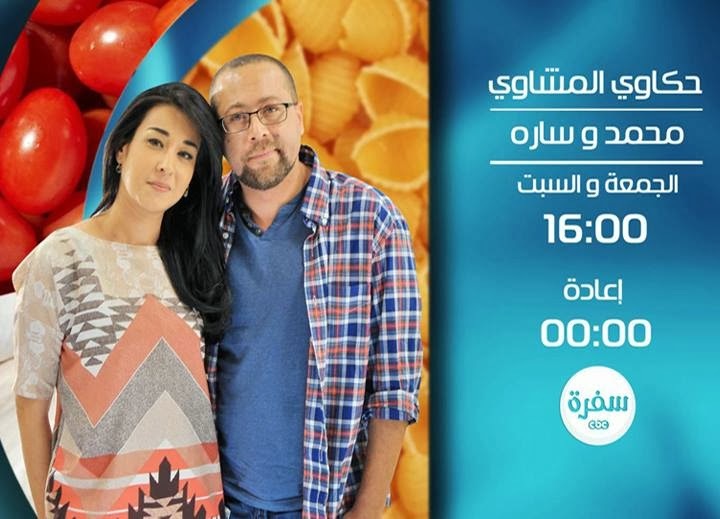 Argue as everyone may, our new Egypt should start taking note of the changing attitudes of Egyptians toward food and how they will evolve years from now. They should also take note that while my stepchildren prefer maple syrup and bananas on their waffles, I'd prefer a fragrant basil chiffonade atop some macerated ripe strawberries in balsamic vinegar. An epicurean treat. Mix flours, sugar, baking powder, salt and cinnamon together in a mixing bowl. Add milk, water, eggs, and vanilla to your dry ingredients and mix well. Pour gradually into your waffle maker and cook according to your waffle maker directions. Serve with butter, syrup, fruit and sticky kisses due to stealing the first waffle. They call me Cuban Pete. I'm the king of the Rumba beat. When I play the maracas I go Chick chicky boom, chick chicky boom, chick chicky boom. Just discovered your message in my blog about the chocolate cake coming out great. I'm so glad it worked out well for you and mint does sound exciting to me. Will try it next time I make the cake. Hope you guys had an awesome time. And btw let me just say that I DIE for waffles and if it looks anything like this I do KILL for it! 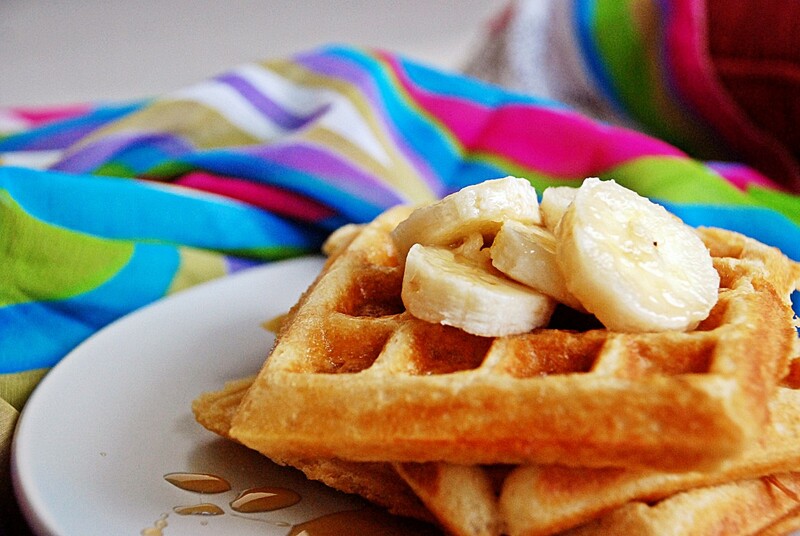 Sliced bananas are a good addition to the waffles.